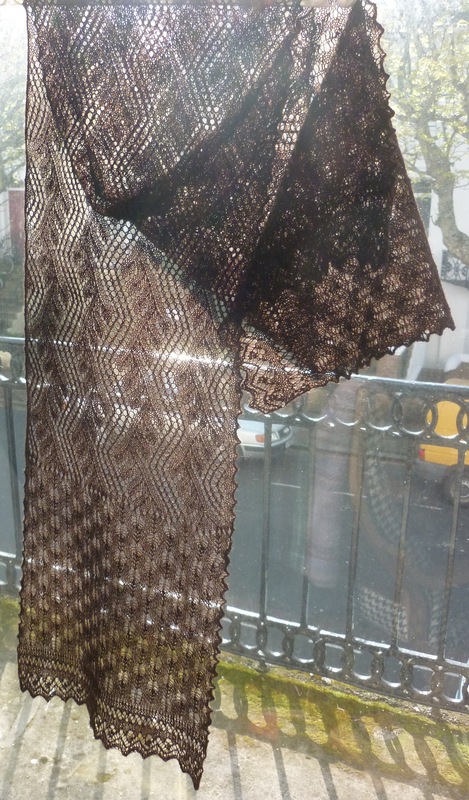 It must’ve been almost a year ago now, that my mother asked me to knit her a lace scarf. For some reason, this was quite a big thing for me. My mother used to be a really good knitter (she doesn’t knit much anymore), although I don’t remember her ever knitting lace. Nonetheless, I knew she would really appreciate the skill, time and effort involved in knitting a lace scarf, which is something that non-knitters don’t really seem to get somehow. But it also felt as an acknowledgement that I, a man, and her son, can actually also be taken seriously as a knitter. Chosing the lace edging proved more difficult: I had already knitted the centre and borders, before I had finally decided on the lace edging. I didn’t really like any the separate edging samples in Don’s book for this scarf, so after much deliberation, I chose the edging from “Baby’s Shawl in Several Patterns”. 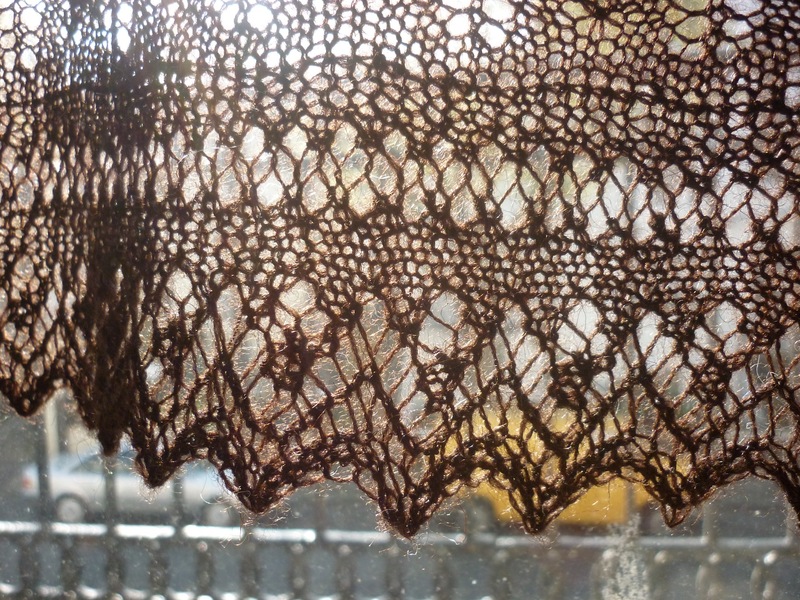 One of the elements that I really like of this particular lace edging, is the faggotting along the straight edge. As you can see, the lace holes are elongated and alternate slanting to the left and the right. 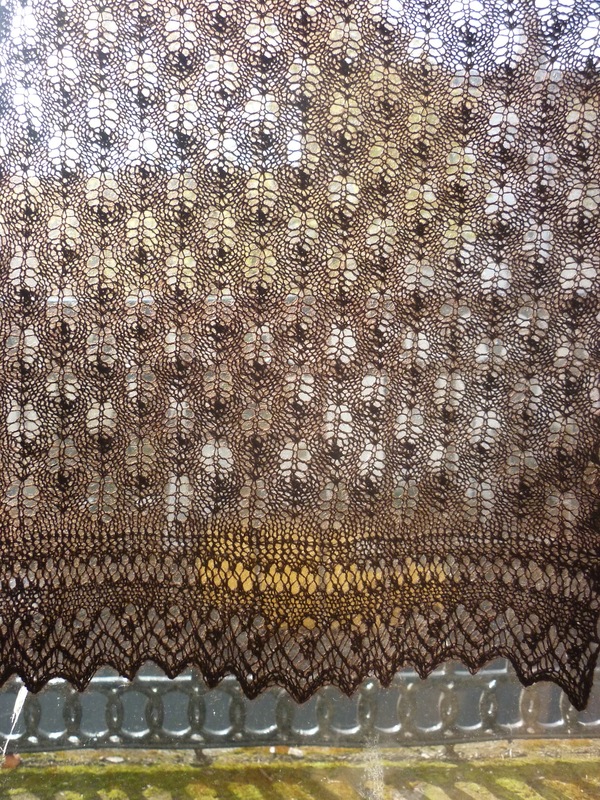 But unlike the Print o’ the Wave and the Fir Cone patterns, which are very organic in their design and therefore easy to memorise (after knitting one repeat of either, I didn’t have to refer back to my charts, which really speeds up the knitting), this lace edging turned out to be more elusive. If you study the top chart (you can click on the picture for a close-up view), you can see that the yarnovers and the decreases keep changing their relative positions in the centre and right side of the chart. The zigzag points were easy to comprehend – they are a standard design element. But even after highlighting the yarnovers on the bottom chart, I just could not get this pattern in my head and I had to refer to the chart for every row every single time. On paper, placement of the decrease on the left or the right side of a yarnover made sense, but once on the needles, they suddenly seemed randomly placed. But looking at the end result, I’m very pleased to have persevered. I’m very proud of this scarf, and I hope I have done my mother proud, too. This is so lovely. 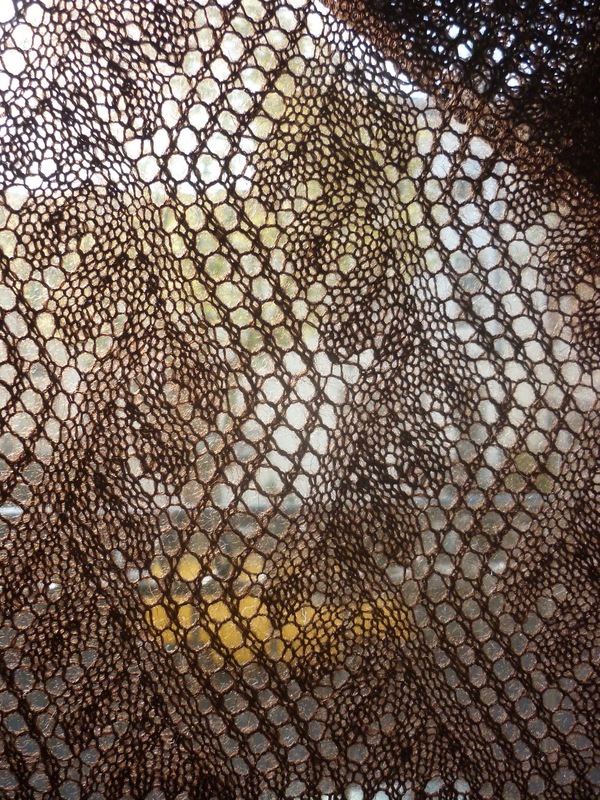 I’m in awe of your lace knitting skills, and your design sensibility. on April 13, 2012 at 2:06 pm | Reply Kim B. How wonderfully intricate – you are a fabulous knitter! Mum is a very lucky lady. Just breathtaking! Your Mom is one lucky lady. Well if you were my boy, Tom, I would be very proud of you indeed. I especially love the way that you have put sea and land together, like a desert island of northern climes. Beautiful. It is just beautiful, Tom!!! And so fine; I am sure she loves it! I agree with Colleen – it’s beautiful that you have linked this lovely knitting to the land and the sea. And you have done such a lovely job of it with characteristic attention to detail and care taken with all the elements of construction. I should think your Mum will be thrilled. 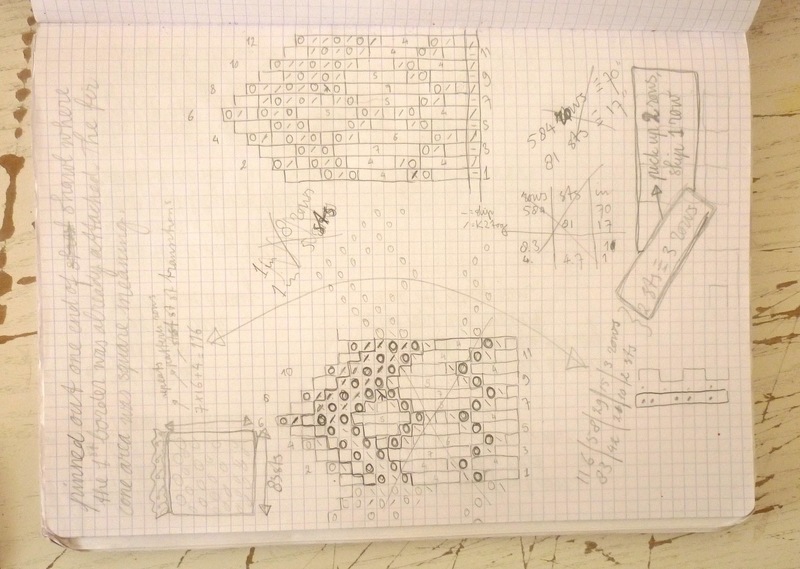 I love seeing your pencil drawings and notes on the blog, beside the knitting. Truly beautiful. It makes me want to knit something with print of the wave right away! Thank you all for the lovely comments. I really enjoyed knitting this scarf. My mother always knitted me the most beautiful jumpers when I was a kid, and I was always allowed to choose pattern and colours. It’s a nice way to be able to knit something for her now. And she gave me free reign! I love dark lace, perfect to make any mother proud. And thanks for the amazing vision of fir cone lace opened up- amazing. So far I have not found any information on the patterns themselves. But it is not impossible that there was some ‘cross-fertilisation’ going on here. This is absolutely beautiful. I am only a beginner in knitting lace so I know how difficult it is getting started. You have made a fantastic job. oh so beautiful, and especially so in the figgy color. how nice! Thank you. 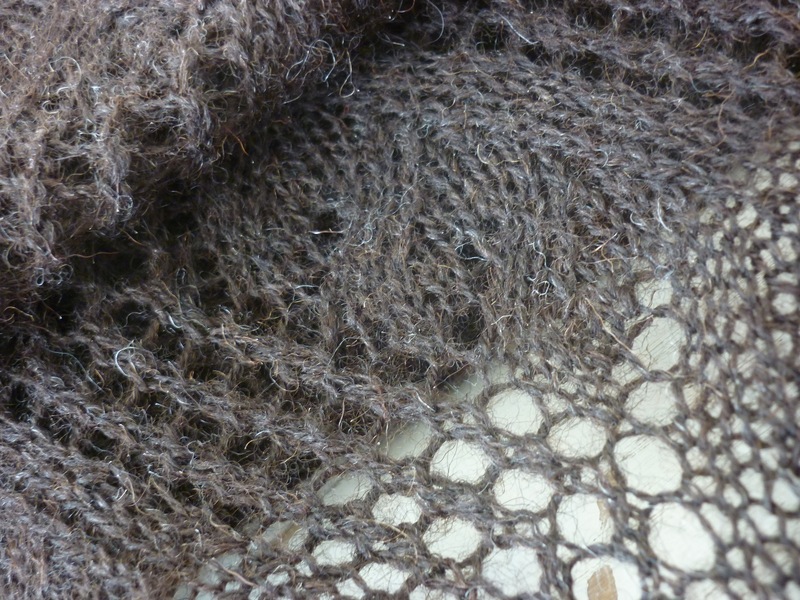 The colour is called ‘black’ in Shetland, although it’s the natural colour and is more of a really dark brown. It’s one of my favourite yarns!